(Original Platform) How do I create an article using the writing tool? Atomic Content is where you can write and edit any form of written content. 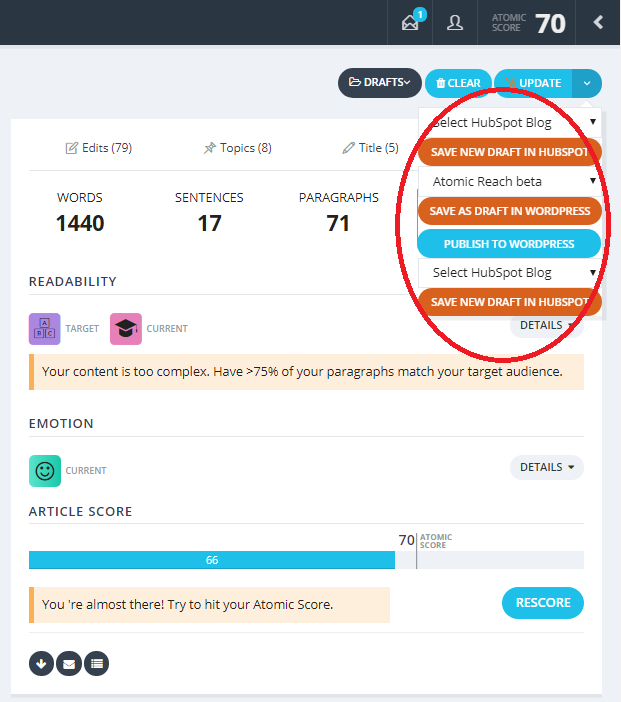 Atomic Reach provides feedback based on the length, content, emotion, and title of your document, giving you personalized suggestions to improve your writing. Create and write a new document. Step 1: To start a new document, simply go to Atomic Content and click on the Article/Blog button. Step 2: Now take a look at the bottom bar, this is where you control your editing options and see your workflow. Tip: Depending on the document type you selected, your bottom bar may not include as many options as shown here. Target, Highlighting, and Readability are settings to help you establish what kind of article you are aiming for, and how much feedback you would like to see at once. Step 3. Set your Target, picking between our 5 readability levels.Tip: by default, the Target is set to your best readability level if you have content and engagement, and is set to Knowledgeable otherwise. For more information on readability levels, check out our article on readability. Step 4. Select Readability to see the Smart Match value. Smart Match controls the contextual level used in our readability engine, the higher the match value, the more selective the word suggestions become. Turn on Readability or Emotion to change the match value. We suggest that you turn on Readability while you are writing your article so that you can see your paragraph's readability level via the color-coded vertical bar to the left of the paragraph. Tip: To ensure your editing process is as easy and smooth as possible, it is best to keep your paragraph level as close to your Target as possible during your writing process. You may also turn on other measures like Length, Emotion, and Links; however these measures are best used during the editing process. For more information on how to best edit articles with Atomic Content, see our article on editing a document. Step 3: Keep an eye on the Topics tab in the right feedback bar and make sure your article's topic is on the right track. Step 4: You can save your progress as a draft via the Save button. Note that you have several save options if you have an integration connected. If you have any questions, feature requests, or would like a demo of our Atomic Content module, please reach out to support@atomicreach.com and we'd be happy to help you.